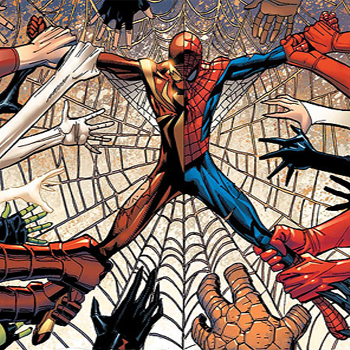 Turns out Spider-Man almost joined Marvel's Civil War... but then didn't. The big surprise year-end story of Hollywood continues to be the ongoing release of countless emails, private documents and more from the Sony corporation by hackers. The studio has already seen everything from entire feature films to sensitive financial information leaked, and now the list includes - perhaps innevitably - further details of the studio's ongoing difficulties with their troubled, financially-disappointing Amazing Spider-Man franchise. A new report in The Wall Street Journal reveals that longstanding rumors about Sony Pictures (who own the movie rights to Spider-Man) and Marvel Studios (who own everything else about Spider-Man) talking about a potential collaboration between the studios which would've brought Spidey home to the Marvel Cinematic Universe were true - and almost came to fruition. The hacked emails (mainly attributed to Sony's motion picture chief Amy Pascal and president Doug Belgrad) describe a hypothetical scenario wherein Marvel Studios would've produced a new series of (presumably) MCU-connected Spider-Man films to which Sony would've retained theatrical distribution rights. Pascal's emails further reveal that Marvel was especially keen to have Spider-Man appear in the recently-announced sequel Captain America: Civil War, which is based on a famous comics miniseries where Peter Parker played a key role. Unfortunately for fans, the talks between the two studios "broke down," and Sony returned to its still-nebulous plans for an in-house Spider-Man Universe, which reportedly now includes the possibility of an animated comedy feature from the makers of The Lego Movie.